Add this vanity to your bathroom for more modern style in your home. With a white ceramic counter and black particle board base, this product is good-looking and useful. The double-door cabinet and drawer are great for putting away bathroom items. Put a nice touch on your bathroom's look with this vanity set from GLACIER BAY. With a traditional look and strong design, this vanity will help any bathroom look nicer. 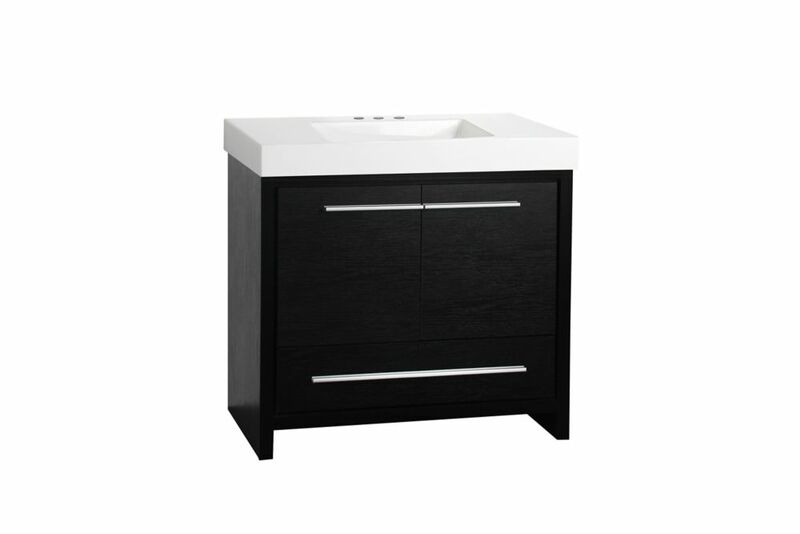 With a black granite counter and white solid wood base, this product is good-looking and useful. Put together your perfect bathroom with this stylish vanity set from Avanity. For some added traditional style in your bathroom, choose this beautiful vanity. Its comes with a nice white marble counter and black plywood base for strength and style. Made with a roomy double-door cabinet and drawer, this vanity has lots of room to keep items like toothpaste, towels, and hair brushes. Put a nice touch on your bathroom's look with this vanity set from Bellaterra. Designed with a traditional style and strong build, this vanity is a perfect choice for any bathroom. Its white ceramic counter and black plywood base will look beautiful in your home. Its double-door cabinet and drawers have lots of room to keep all of your bathroom items. This set from Bellaterra is great for anyone looking for great style and function in their bathroom. Romali 36-inch W 1-Drawer 2-Door Freestanding Vanity in Black With Ceramic Top in White Add this vanity to your bathroom for more modern style in your home. With a white ceramic counter and black particle board base, this product is good-looking and useful. The double-door cabinet and drawer are great for putting away bathroom items. Put a nice touch on your bathroom's look with this vanity set from GLACIER BAY. Romali 36-inch W 1-Drawer 2-Door Freestanding Vanity in Black With Ceramic Top in White is rated 4.7 out of 5 by 3. Rated 4 out of 5 by Catharine from Looks great for a reasonable price I purchased this for a bathroom reno - it looks great and it was under $500 so that is a bonus. People have commented on how nice it looks. The counter is thick white and easy to clean. My only complaint (and it's a small one) is that the bottom drawer is just not quite deep enough to hold the TP rolls, which was my intention) but it's really not a big deal - I just put them inside the unit. First world problems! Rated 5 out of 5 by Perry from Excellent Bathroom Vanity I purchased 4 of these for a project and I am very happy. Dear Fernee, The vanity is available in stock now, please kindly check on the webstie.